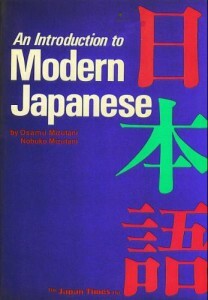 An Introduction to Modern Japanese by Osamu Mizutani and Nobuko Miiztani is a complete beginner’s course in Japanese. The 30 lessons teach you hiragana, katakana, kanji, grammar, vocabulary and intonation. Each lesson contains a dialogue, a discussion of the dialogue, structure drills, usage drills, pronunciation practice and reading comprehension. There’s also a listening comprehension section but no transcript is included so you need to have the cassette tapes. An ideal use for this textbook is if you have a Japanese friend or language exchange partner who has no teaching experience. Simply by working through the book together you will get a very strong grounding in the basics of Japanese.